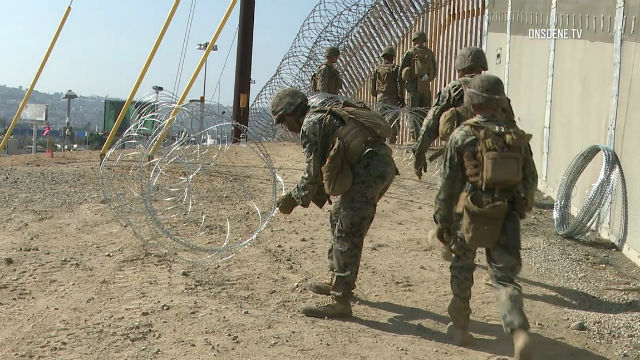 The Marine Corps commandant has reportedly warned top military leaders that President Trump’s deployment of troops to the border risks combat readiness. In two memos sent on March 18 and 19, according to the Times, Neller said that he has canceled or reduced planned training in five countries as well as delayed needed base repairs. Trump ordered active-duty Marines and Army troops to the border shortly before the midterm elections last year, claiming immigration was a risk to national security. There are now 6,000 military personnel currently at the border, including 2,100 from various states’ National Guard and 3,900 active-duty forces, including Marines from Camp Pendleton. Trump has since declared a national emergency, and is now seeking to move about $6 billion from Pentagon funding to build Trump’s long-promised border wall.